I have had the Jacquard Indigo Dye kit sitting with my dye materials for way too long. After gaining confidence in other areas I decided to take the leap and make the dye. I'm not sure why I thought it was so intimidating because it was SO EASY! Shown above is what comes with the dye kit. It also includes a package of thick rubber bands and a set of Popsicle sticks for shabori dyes. They are not pictured because the thick rubber bands are THE BEST and I have used them numerous times in other projects. I wish they would have included longer gloves. The set of gloves that comes in the kit come to your wrist. Longer gloves, like dish washing gloves would be better since you're reaching into a 5 gallon bucket quite often. These small gloves didn't work for me and let dye in anyways, turning my hands a wonderful shade. Along with the kit you will need other materials ---> 5 gallon bucket, towel/rag (to clean up spills), liquid measuring tool to measure water, long stir stick, tongs to grab fabric out of dye bath, plastic wrap if you don't have a lid for your bucket and a metal pan or a surface you can set your dyed materials out to dry after dyeing. Follow the directions by adding all of the packages into the warm water. Stir until dissolved and then cover and wait about 30 minutes. I used an old bucket rather than buying new but it didn't have a lid so plastic wrap worked. The dye will come out greenish yellow as soon as it is removed. This is completely normal. I was so fascinated by this oxidation process. 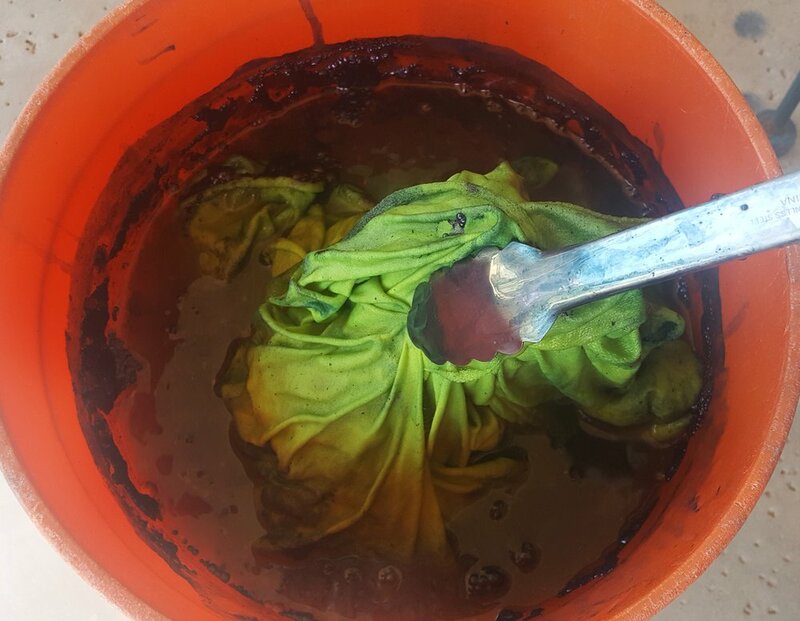 The oxidation of the dye was like magic and I had to sit and watch it each time I brought another piece of fabric out of the dye bath. The image above is the green color when fabric is initially removed from the dye bath. See photo below for final results after the oxidation process had occurred and the fabric turned. This was a great kit, especially for a beginner to indigo dye, like myself. 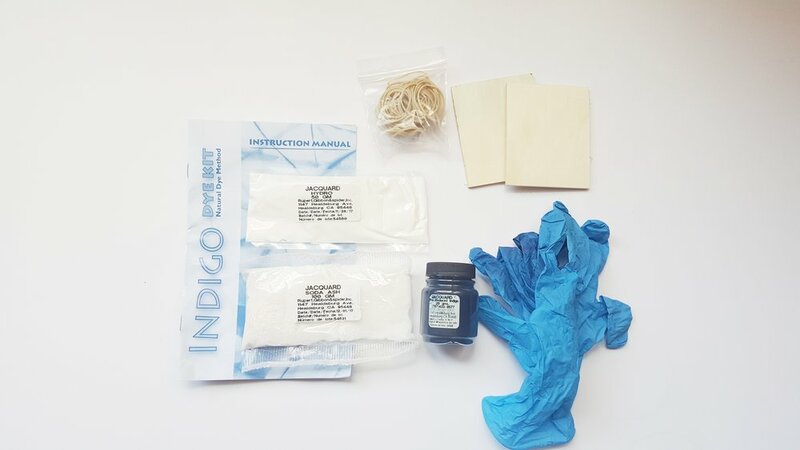 If I planned to dye indigo often I would buy the materials in bulk but if only doing it for fun every so often I think this kit is a great value and has most of the materials you need to create an indigo dye.